Browsing through some old slides (remember them?) last week I came upon a few that I had always liked and decided to scan them and see how they looked in digital format. Despite being stored carefully the color had changed and dust and scratches had also affected them. After some post-processing work on the computer however, I added some creative effects to them and came up with some looks that I liked. 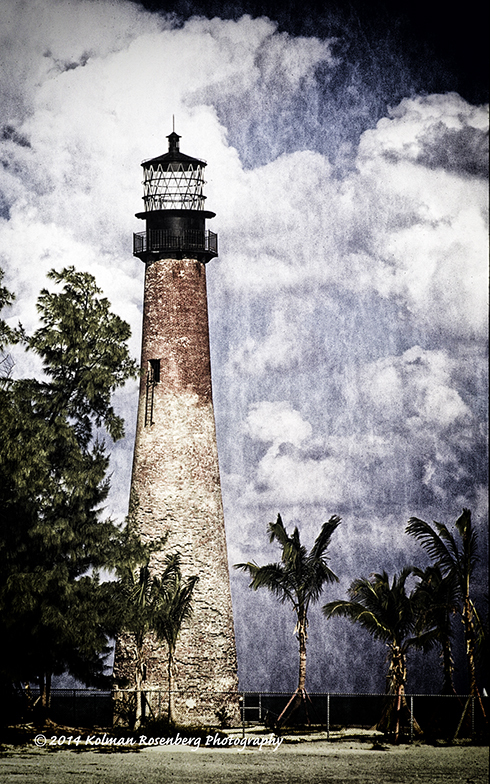 This first shot, of Cape Florida Lighthouse at the tip of Key Biscayne, was under some restoration at the time. The brick was badly flaking and they had just planted some new palm trees around the base. The last time I saw Cape Florida Light, it had been painted white and I really missed the beautiful bare brick color that it had been during my years in Miami. This photo, “Summer Breeze” was shot just a few hundred yards from the lighthouse looking south from Cape Florida State Park out into Biscayne Bay. The sailboat is framed by pine needles and in the distance on the left can be seen some homes which were known as “Stiltsville”, a group of homes built on stilts out in the bay. Texture and an antique look were added to this photo to hide some of the effects of age. I entered this photo, in it’s original state, in the old Cleveland Press Photo Contest shortly after I moved to Cleveland and won $50 for a second place finish! Both of these photos provide me with a little warmth during this snowy and cold Northeast Ohio winter! This entry was posted in Uncategorized and tagged biscayne bay, cape florida, cape florida state park, florida, key biscayne, lighthouse, Miami, sailboat, sailing, stiltsville, summer. Bookmark the permalink. A nice little respite from the cold — thanks, Kolman! Thanks Lenore! That’s what I thought! Hi Kolman! 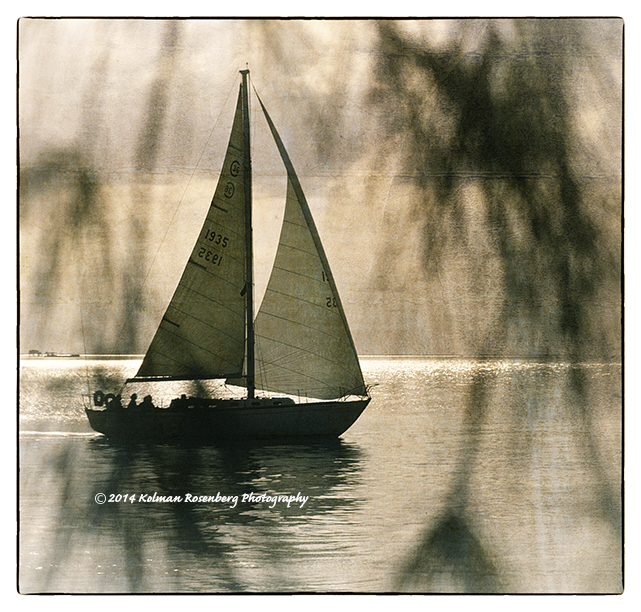 Love what you did to these images, ESPECIALLY the sail boat! Now you are making me want to dig out my old slides and dust off the film scanner. Go for it Michelle! There are probably many treasures there!